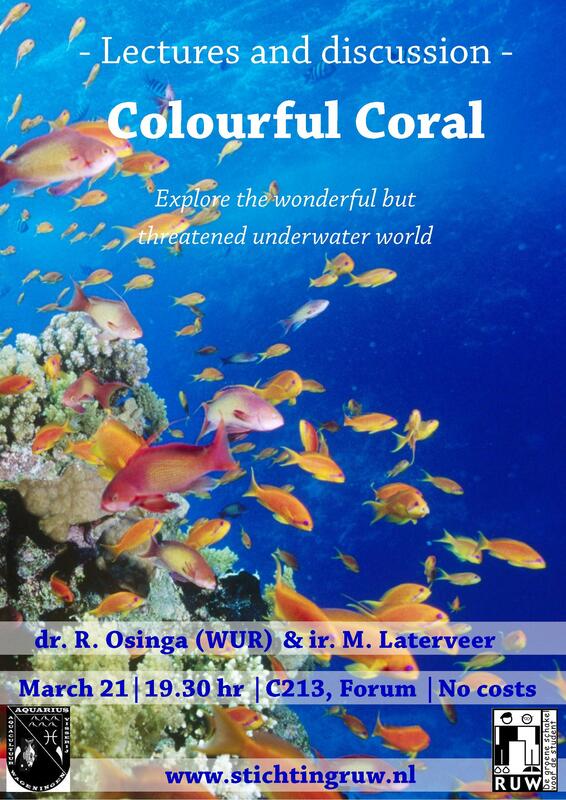 On the 21st of March over 50 people gathered in room C213 of Forum to listen to two lectures on Coral, organized by RUW and Aquarius. The first speaker of this evening was Ronald Osinga, researcher at the Aquaculture and Fishery group at Wageningen University and Research center. He started by explaining what he and his group do: breeding coral in aquaria. The need to do so is urgent, since coral is rapidly disappearing on a worldwide scale, while it is of major importance for the underwater ecosystems. Coral can also be used as medication. He showed different kinds of coral and explained how corals live and how they are affected by external factors like climate change. The second speaker was Michael Laterveer, former curator of the aquarium in Blijdorp Zoo in Rotterdam en currently owner of the company Blue Linked. He is an expert in breeding programs for endangered stone corals and told us a lot about that. He also showed what kind of work he is doing in different exotic locations. This evening was closed by an interesting discussion, which found its continuation in the drink afterwards.